Nostell Miners Welfare have sent more shockwaves across the league with the addition of star Armthorpe Welfare striker Liam Radford. Radford has been one of the best Division One strikers of the past five years because of his very prolific spells with Glasshoughton Welfare and Pontefract Collieries. 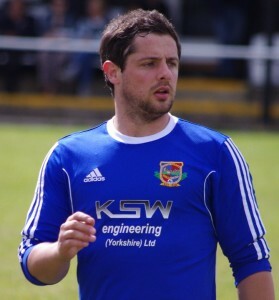 He briefly played at Nostell under Paul Lines in early 2016. Radford showed that he’s still deadly in the NCEL when he scored twice in Armthorpe’s local derby win over Rossington ten days ago. Nostell joint manager Simon Houghton told Non League Yorkshire: “It is an unbelievable capture for us. “When we got the job last week he was one of our (Houghton and Jason Dodsworth’s) first targets. Because of the seven days rule we had to wait, but when we were able to talk to him, we persuaded him to sign. “He’s played for me before and he was fantastic. I know that he will be a great asset. Radford arrives ahead of the crunch clash with fellow strugglers Retford United on Saturday.